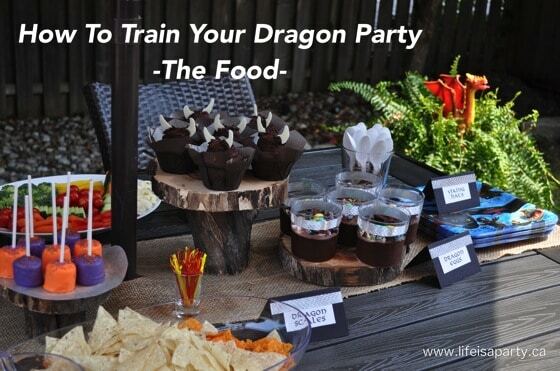 How To Train Your Dragon Themed Food: perfect dragon themed food for a party -dragon poop, dragon claws, viking cupcakes, fire breathing dragon cake and more! Today I’m sharing more from my friend Allie’s “How To Train Your Dragon Party”, and all the great food her Mom made for the party. All the fun details were adorable! Let’s start with the drinks. 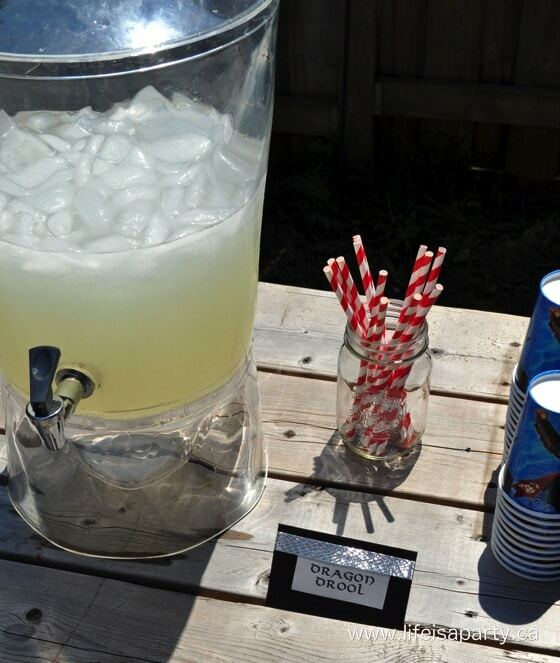 The Dragon Drool was delicious -also know as lemonade, and the perfect Viking thirst quencher. 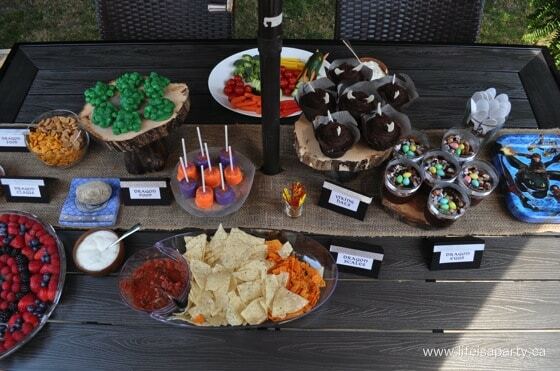 And for anyone working up a bit of an appetite while training their dragon, there were some lovely snacks. 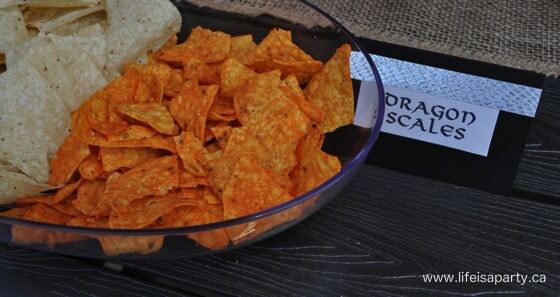 Like these delicious Dragon Scales -also sometimes know as Doritos. 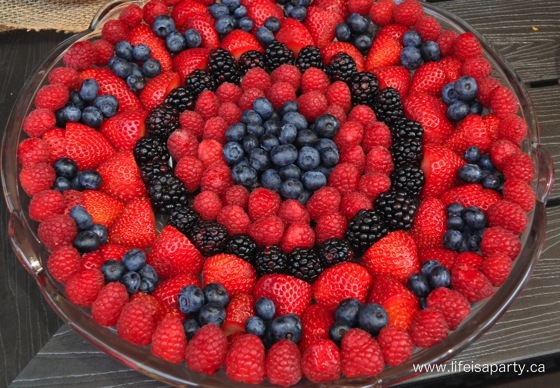 All Vikings enjoy their fruit more when arranged to resemble a Viking shield. 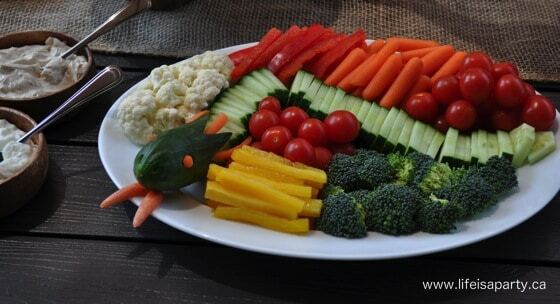 And veggies and dip are so much better when they resemble a dragon. 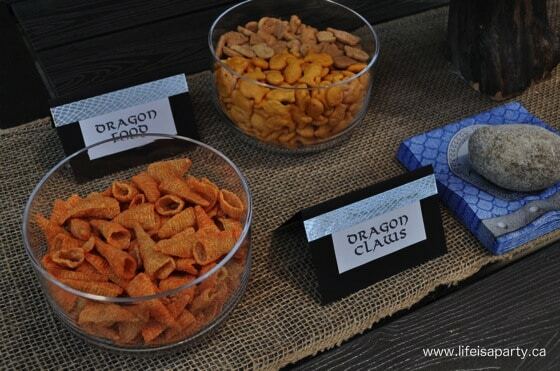 And since Dragons always enjoy fish -even fishy crackers, it’s always good to have some on hand. Vikings also enjoy Dragon Claws, you might know them as Bugles. We all enjoyed the snacks while we were training our dragons, but when that hard work was done it was time for some sweets. 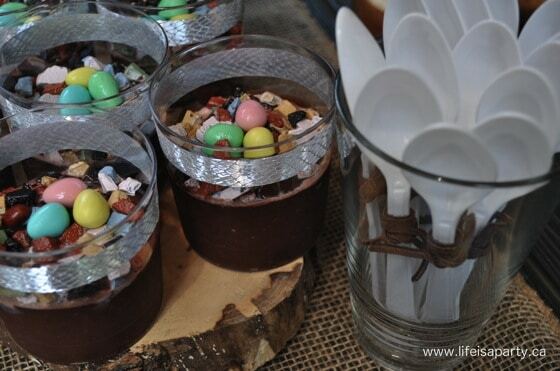 Every Dragon party needs some Dragon inspired desserts. 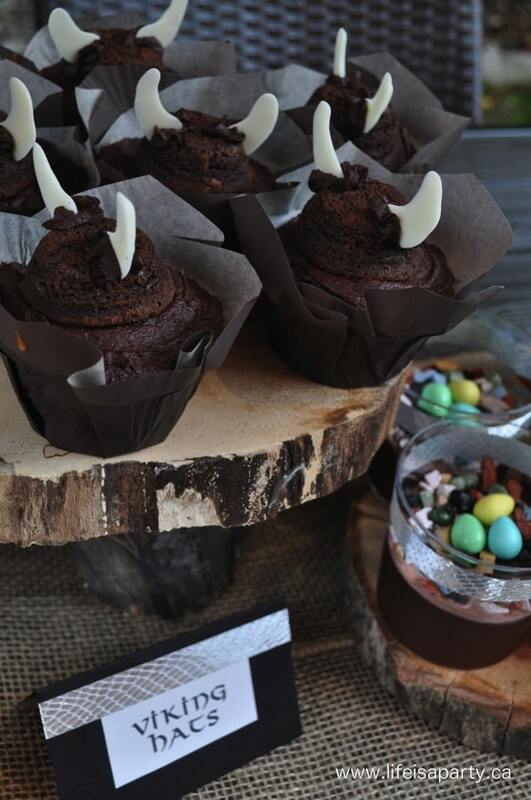 The Viking Hats were made from chocolate cupcakes and icing toped with a two-bite brownie, and viking hat horns were made from white chocolate. They were adorable and they were delicious. There were also Dragon Eggs. They were made with chocolate pudding, that was topped with chocolate rocks (that were actually really delicious) and some Cadbury eggs. I love the detail on the cups and the food labels with the “dragon scale” tape (found at Walmart one day), and the the leather cording tied onto the spoons. All so very Viking-ish. 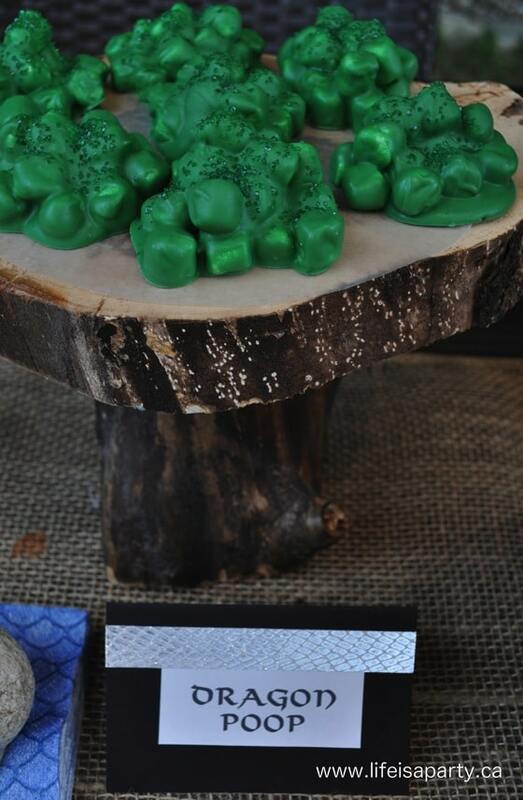 I big hit with the kids was the “Dragon Poop” made out of mini-marshmallows, green chocolate and green sugar sprinkles. Yum. My fav. 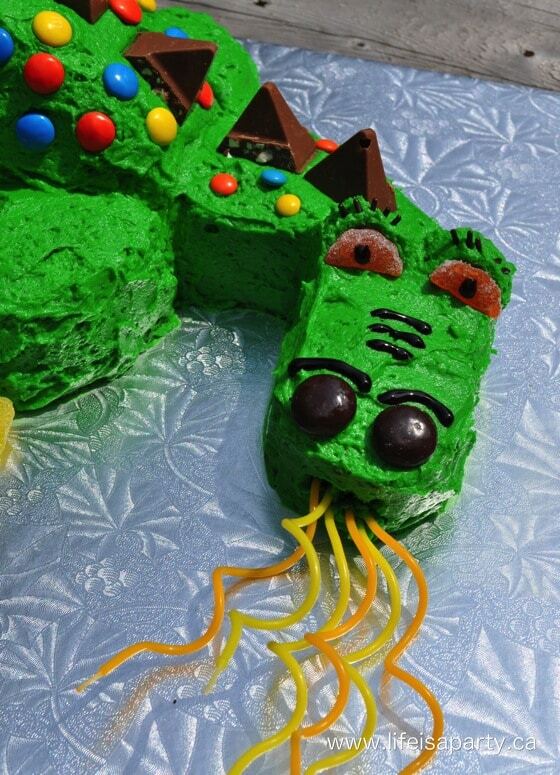 had to be the amazing Dragon cake that my friend Heather made. She used a round cake, cut in half and on it’s side to create the main body, and than cut up another cake for the head, arms, legs and tail. All the details were amazing. Loved the wings made from some tissue paper and chopsticks! Also loved the Toblerone triangles used to decorate the Dragon’s back. Best of all, had to be though, that this Dragon actually breathed fire! 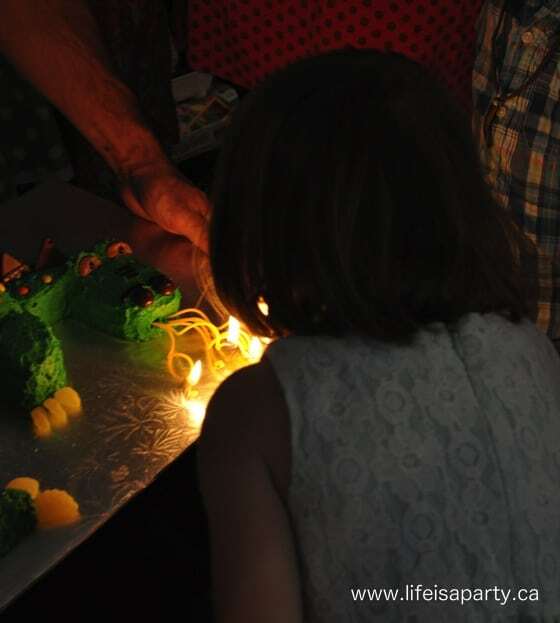 The orange and yellow birthday candles were inserted where his mouth was and looked amazing when lit! 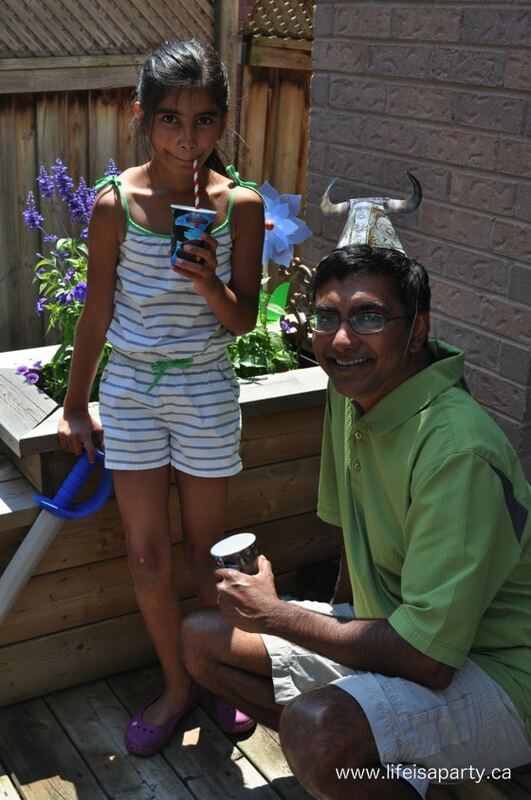 We loved all the dragon-y treats at the party. If you missed yesterday’s How To Train Your Dragon Party post about the activities and all the great decorations make sure to check it out here. 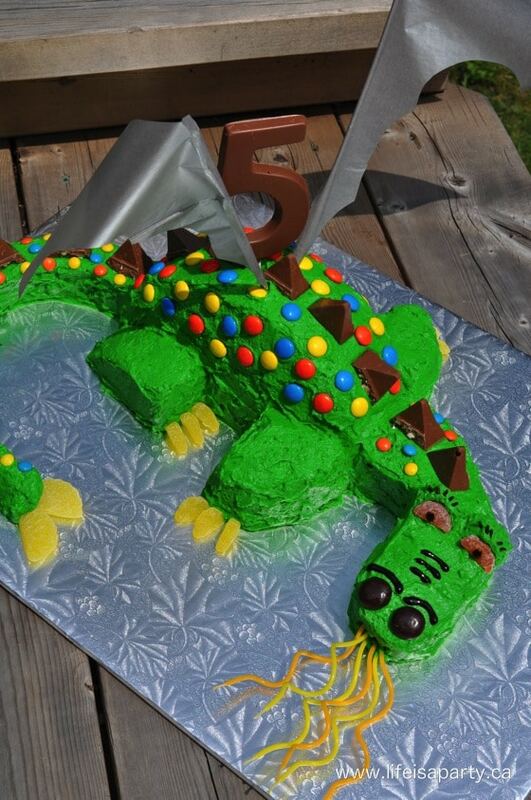 We had such a wonderful time celebrating Allie turning 5 with her “How To Train Your Dragon” Party. 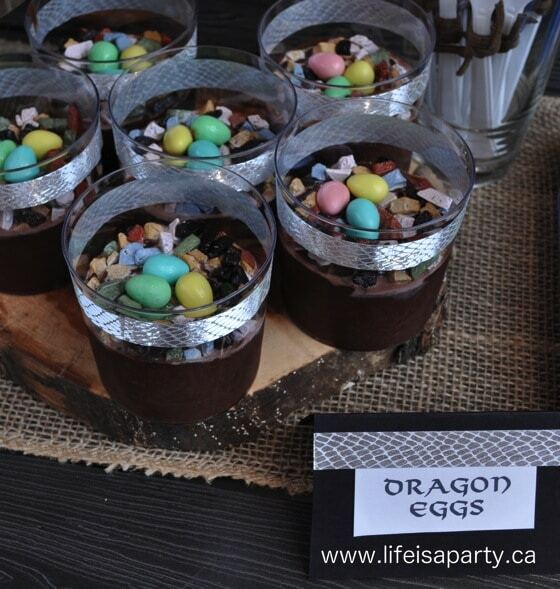 With dragon treats like this, life really is a party! Amazing party – thx for sharing it! Sooooo many ideas! Please, were the tree stump food stands DIY??? You can find the tree stump cake stands by clicking here. Hope this helps. 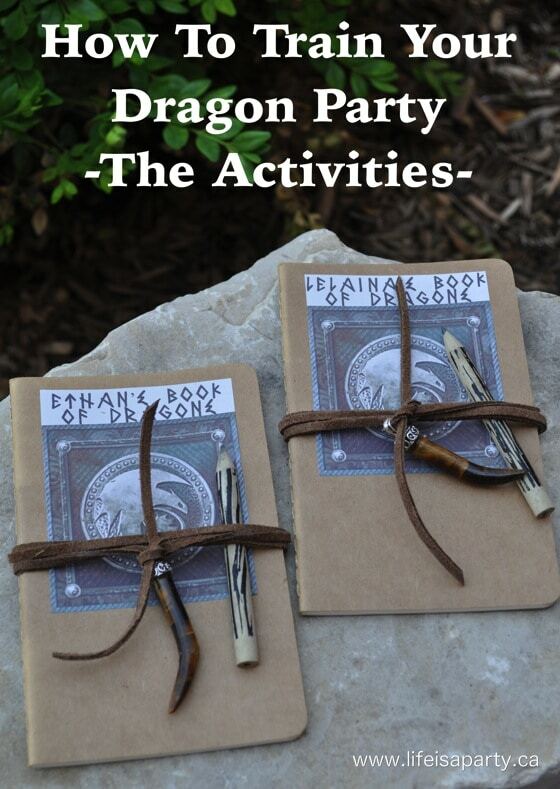 Do you have directions for making the dragon poop? Love the idea!! Hi Elaine, it’s very simple to make the “dragon poop”, just combine mini marshmallows with melted green chocolate candy melts, and spoon out on parchment paper in little servings to set. Before the chocolate sets, sprinkle the them with sugar sprinkles. Hope this helps, best of luck. Super cute! 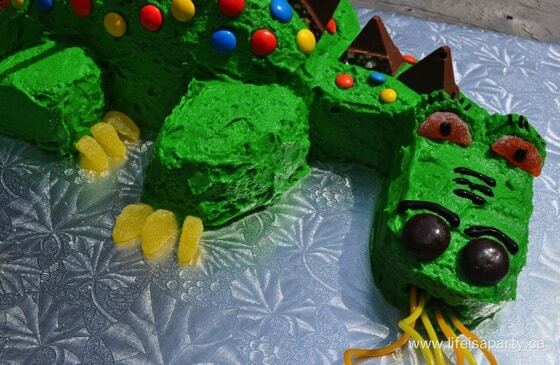 Doing the dragon cake for my son’s 8th Birthday this weekend. For the cupcakes, what white chocolate did you use? Hi Amy, I think she used candy melts. Hope this helps. Hi Stacy, yes your dragon poop should be fine overnight. Just be sure to store it in an airtight container.